If it's your time to take action. If it's your time to be inspired towards health, happiness and wellbeing. If it's your time apply for your time now! When you are feeling out of sorts, tired, emotional, anxious or depressed. When you need support, clarity and guidance during periods of life changes and stressful times. Relax and recharge your energies by focusing on your body, mind and emotions with an body & mind energy balance treatment. Are you in physical pain, feel tension in your body, suffer with any kind of physical condition then this treatment is for you. Have your body released from stress and pressures that are causing the pain. Do you need razor sharp insight into your business or life? Feel torn between the daily tussle of life and running your business? Are you are stuck in a rut, feel emotionally drained, have lost your mojo? Are you in need of fresh inspiration? I offer one to one sessions to give direction and support you need to get your business back on track. Therapy sessions are available to re-charge your energy, release the stress and pain from your body and get you thinking in the right way so feel back in control of your life. Please contact me to arrange a discovery call. A symposium for women in business. Come and join me! I take you through a workshop to find your neutral zone. With lives so busy keeping up with family, work and social pressures and the immense burden that can come from our fast paced world of technology its hard to find time for yourself. Its no wonder that our nervous systems suffer, our energy feels depleted and our anxiety levels increase and illness or pain manifests. This relaxed and fun workshop helps you understand and recognise the stress triggers in your life and gives you practical tools and advice to resolve and manage the physical and emotional aspects towards your own self care. Discover the calm in the storm and explore your spiritual connection. Activate and move stagnant energy in your body and mind to find balance and harmony within and without! A fusion of mindful movement therapy techniques (yoga, qi gong, polarity energy exercises, stretching and strengthening) to activate your energy, stretch and relax your muscles. Combining relaxation methods to balance your nervous system and meditation to calm your mind. A truly all round healing for your body, mind and emotions. 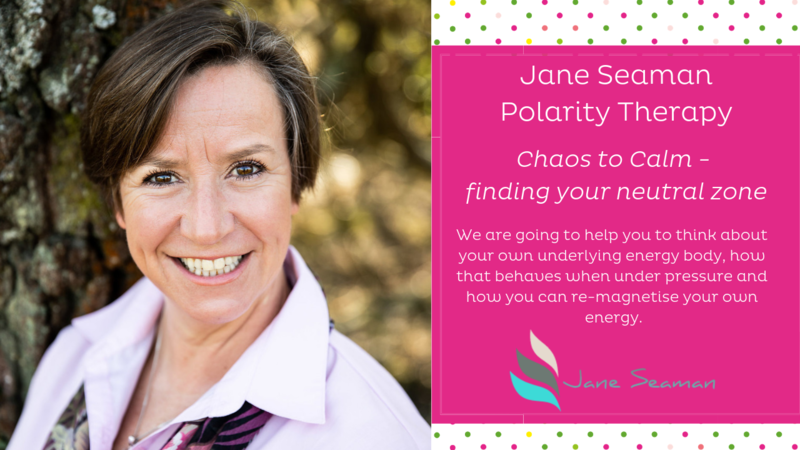 I had a Polarity session so I could understand more about Jane’s work with energy flow within the body and ensuring it is flowing correctly, and crikey it was amazing! I felt like a new person afterwards! Within five minutes of our consultation, Jane had pinpointed a trait within me that I had never noticed, but it explained so much about my energy levels and why I was often feeling the way I was... She's incredible and so intuitive! I'd definitely recommend Jane to anyone looking to find balance, gain clarity and address any aches and pains within the body." “I have been seeing Jane for Polarity treatments for about a year… and the results are amazing! She has helped control my hot flushes, back pain and my stress levels. I have recently given up smoking and she has been helping my body cope with the loss of nicotine. I have no hesitation in wholeheartedly recommending her". "I had a Polarity treatment with Jane which I thought was amazing. It was difficult to know what to expect but it delved deeper than I imagined. I felt deep rooted emotional energy blocks shift after just one treatment. With Jane’s knowledge and and guidance alongside the healing energy, I feel more grounded, calmer and stronger in myself. This is definitely one for emotional imbalances and working at a deeper level of your psyche". "I have been having Polarity Sessions with Jane on an "as I need them basis" for some time now. She has helped me with my back and hip problems, has managed to somehow totally eradicate my hot flushes and has taught me to look at life situations from a different angle; and not make such an issue of things that I found difficult. She is magical and really does have the ability to make you feel so relaxed and totally at ease. Mentally and physically I come away from each session feeling like a totally different person. I cant recommend her highly enough. Thank you Jane so very much". "Having sustained a whiplash injury, I was advised to attend several physio clinics, both at my local GP plus the hospital. After a period of several years my condition had not improved the daily pain I was living with. I decided to try another route. The Polarity treatments I received from Jane were of great benefit, after suffering for years, I found I had little or no pain. During the monthly treatments, I found it most beneficial to talk to Jane about the impact of the accident and how it had impacted my personal life. After a series of consultations with Jane I found I was able to move more freely and regained a positive frame of mind to gain an understanding of what I was capable of doing on a daily basis. I thank Jane for her patience and understanding and highly recommend Polarity therapy. It succeeded where everything else had failed". "Jane is an inspiration & incredibly knowledgeable in her industry. 5 star treatments every time! Thank you!" "Great to have time to stop! Didn’t know what to expect but found myself relaxing...surprise surprise and feeling so good now, like I have been re-charged and my mind is calm and clear." After three polarity therapy treatments and a polarity therapy massage I find I not only have more energy and am sleeping better, I feel freer, more positive, more productive and more light-hearted. I am calmer, able to take on more and focus and keep a clear mind. It is as if I have my path in life mapped and now have all the power to follow it. Jane’s polarity massages go to depths no other massages go. Not only are they deeply relaxing and restorative, they give you mental and emotional clarity too. Jane reads both your body and your mind with her work, and you gain so much more from her massages than merely physical. They help me de-stress and put all my worries into perspective, bringing extra energy and joie de vivre. Jane is a highly skilled, empathetic and intuitive therapist. Can highly recommend polarity therapy with Jane. I've had a couple of sessions to re-shift my energy and for a nervous system balance. Thank you, Jane. A completely wonderful lady - one of the ones you feel lucky to have met! Jane's 1-1 sessions have helped me with both business and personal life, conducted in a relaxed style in her central Lymington location. Wishing I lived close enough to attend her evening meditation sessions! My session was a real tonic in a hectic time. It helped bring clarity and positive energy at the darkest point of the year. Fabulous, thank you, Jane. Thinking positively can create such beautiful forms….become crystal clear on your thought patterns…. Ride the wave of positive energy and get yourself ready for 2019!